Most wedding-world nerds know about first looks, but most people getting married aren’t exactly that (yet), so it’s something that can be helpful to learn more about as you make plans for your wedding. Traditionally, the groom sees the bride for the very first time the moment she walks down the aisle. However, in the last few years, it’s become increasingly popular to see the bride before the ceremony at what is called the “first look”. It’s an opportunity to set up seeing each other for the first time, in a beautiful place, with some pre-staging so that the photos are extra great. Many venues and photographers tend to encourage new brides to do the first look, but we would argue that both ways do have their advantages and disadvantages. In our experience, it has all depended on the flavor you want for your day. My wife and I were total frauds as wedding photographers and didn’t want to do the first look! Sure, we had cotton candy at our wedding but dangit, we did want that one tradition! We had a long hour and some after the ceremony when our guests were getting to the venue, that allowed time for photos without disrupting the party. Plus, family formals were planned to be super brief, and the photos of the moments of the day were more important to us than posed photos or even a lot of super fancy couple portraits. It totally depends on who you are and the vibe of your day and your relationship! We would have probably stood around awkwardly if we’d seen each other pre-ceremony, whereas my sister-in-law and her soon-to-be-husband ate breakfast at our house with all their 30 of closest friends, first-looked, and pre-gamed the ceremony with shared soup. Here are a couple sample timelines for weddings with a first look and weddings without so you can how it can go down either way. Hopefully this sparks some ideas and helps your planning process! 12:00 Photographers arrive: Getting ready photos, dress, rings, shoes and any other details. 1:30 Groomsmen photos: Portraits of the groom, individual photos with each groomsman, and group shots with all the guys. 2:00 First look: We set up a time & place for the first look, then spend the rest of our time on couple photos. Mainly, we let you enjoy each other & soak in the moment, and we photograph it. 3:00 Bridesmaids photos: This gives the girls a little more time to be completely ready. We get the same set of photos as with the groomsmen. 4:15 Photos done: Touch ups and get ready for the ceremony. 5:30 Cocktail hour: When time allows, we still love to grab some shots of the brand-new-married feeling that just can’t be beat. First look = allows for plenty of time for formals. Big upside: this allows for a lot of wiggle room. Every wedding runs behind and we have had a wedding be running two hours late and we still had enough time to get all the formal photos our couple wanted. The big cushions allow for a much more stress-free time. For us, stress-free equals more fun moments to capture! Since the groomsmen are usually the ones with a little less makeup to put on, it’s a great idea to bring games and plan to hang out together. If you look at it as having quality time with the guys before the wedding, it can be relaxing and fun instead of bored waiting around. Doing a first look also allows the bride and groom to have much more sheer time together on their wedding day—especially for an evening wedding, you may not actually see your person hardly at all on this huge day. After the ceremony, EVERYONE wants to say hi and often with all the business of hugging and congratulating, the bride and groom are separated. A lot of our couples have also used part of the cocktail hour time to just breathe, absorb the moment, and, especially important, EAT FOOD together. (Another fact about weddings, couples basically never have the time to sit down and do their kickass food justice). Doing the photos before definitely allows for more freedom and peace of mind after the fact. We totally hate to drag a couple who are freshly-wed and glowing into a pre-planned list of family formals. Which is why we also encourage our couples to pare that list down to their must-haves! Weddings shouldn’t be about the photos, the photos should be about the wedding. 4:15 Photos done (any touch ups and get ready for the ceremony). For us, and other couples we’ve photographed, deciding to wait to see each other until the aisle isn’t usually about tradition for tradition’s sake (bad luck etc), but more because they love the special sacredness of waiting for that big moment, for all their photos together to be of their actual-for-real-married-selves, and the photos and hanging out together being after the sometimes nerve-wracking ceremony business is over. DOES DOING A FIRST LOOK take away from the aisle moment? It is a misconception that doing a first look will take away from that moment he “first sees you” walking down the aisle. 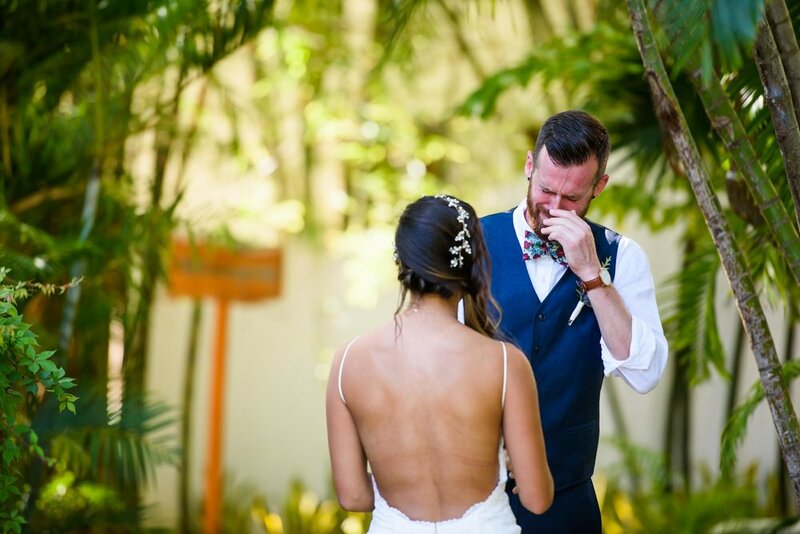 In our experience, if the guy is emotional during the first look, he is going to be emotional when you walk down the isle. Just the next level of it sinking in and feeling real! Aka, criers gonna cry. PS, we also think it’s important that couples just enjoy each other and enjoy their day, without feeling pressured to have a certain kind of visual response, no matter how GOLD crying grooms are to us and humans everywhere. Ha. Know what kind of couple you are! Some people feel MILES more comfortable getting to have those special moments just-them before the intensity and crowd of the ceremony. Getting to just breathe, soak it all in, check each other out, and touch down together is invaluable for them. And the idea of hanging out together up until the ceremony seems way less stressful—we’ve seen many couples’ nerves totally disappear once they see each other. Plus, you don’t have to worry about everyone watching as you see each other for the first time, etc. And others might feel more pressured by such a special, intimate moment. We’re such awkward people, that we might have been more nervous to have big photographable moment together, whereas once the ceremony was rolling, we forgot about the nerves and just zeroed in on each other. *YES, PETER CRIED, and no, Susannah didn’t. At the end of the day, on your wedding day you are FAMOUS. Whether you like it or not, you are like the king and queen getting married. The more you have other people involved to help coordinate your day so you can relax and enjoy it, the better. The choice of the first look is a big one for the vibe and schedule of the day. We have had couples where the formal photos are not that important to them, which means we are able to blow through them all after the wedding and the day still is crazy fun and exciting for them and their guests. Everyone is different and everyone’s idea of fun is different. We hope you have an epic party and make some amazing memories! If you know someone getting married that might benefit from these timelines and notes, send it over and help them have a more fun-filled day!